Vincente Minnelli's Home from the Hill (1960) is a not-bad Southern-fried melodrama, neither as authentic nor profound as it seems to think it is, but fairly engrossing and fitfully rewarding here and there. The leading role was originally intended for Clark Gable but he declined; apparently after getting the bum's rush when his longtime MGM contract ran out, he was in no hurry to rush back to that studio. Instead, the part went to Robert Mitchum, who doesn't quite fit it as well. Mitchum is very good in some ways but the part doesn't really suit him for reasons explained below. Adapted from William Humphrey's same-named 1958 novel, the long (two-and-a-half hours) film actually revolves around 17-year-old Theron Hunnicutt (George Hamilton, about 20 at the time), the pampered, mama's-boy son of rich land baron and notorious tomcat "Captain" Wade Hunnicutt (Mitchum) and his resentful wife, Hannah (Eleanor Parker). After some East Texas locals take eager-to-please Theron on a snipe hunt, Wade breaks a long-held promise to Hannah not to involve himself in the raising her of son, and offers to teach the boy how to "man up." Taught the manly sport of guns and hunting, Theron turns out to be an expert marksman, and proves his mettle to the entire town after single-handedly hunting down and killing an enormous wild boar that had been menacing livestock. Theron's determination to cast aside the easy life Hannah provided and prove his worth likewise impresses Rafe Copley (George Peppard), Wade's righthand man. At a BBQ to celebrate Theron's kill/coming-of-age, the boy is stunned when Albert Halstead (Everett Sloane), the father of his intended date, Libby (Luana Patten), steadfastly refuses to let the boy anywhere near his daughter. Theron doesn't know about Wade's reputation as a philanderer, or that many in the town worry the acorn may not have fallen far from that tree. Much of the story hinges on revelations of a long-held family secret, but modern audiences and maybe even 1960 audiences probably guessed it is long before the big reveal. I'd anticipated a double-whammy, that Libby would turn out to be the unacknowledged daughter of Wade (Mitchum's character), hence Halstead's abject refusal to let his daughter anywhere near Theron. That would have made a more interesting film. 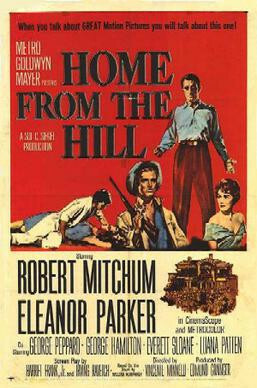 Home from the Hill is a handsomely made, expensive looking production, filmed partly on location in Mississippi and Texas, though much of it on soundstage sets at MGM's Culver City lot, notably the impressive interiors of the Hunnicutt mansion. Parker's character is paper-thin and never believable, yet the movie has many good moments, particularly the wild boar hunting sequence, the opening scene (where a disgruntled husband takes a pot shot at Wade during the duck hunt), and most of the scenes between Theron and Wade and Theron and Rafe. The film offers what is probably George Hamilton's finest performance, long before he became a dipped-in-bronze self-parody (though Hamilton always seemed in on the joke). He delivers a sincere, sensitive performance and he's pretty convincing, though a better actor like Anthony Perkins (at least Perkins circa 1956 or so) could have made Theron's heartache and ambition much more convincing and compelling. On paper the role of Wade must have seemed tailor-made for Robert Mitchum, but it doesn't quite work out that way. Mitchum shared many of Wade's qualities, but Mitchum's appeal was implicit. In Home from the Hill, Wade talks about being tough and what it takes to be a man, or rationalizes his innumerable infidelities to Hannah in wordy speeches, things Mitchum doesn't do in his best movies nor, apparently, in real life. Mitchum seems perfectly cast until he opens his mouth, and then character comes off as phony. Clark Gable, conversely, particularly at this point near the end of his life and career, could have sold the dialogue better, and would have equaled Mitchum's Wade in other respects. The real standout among the cast is George Peppard, in what was only his second film. Where Mitchum and Hamilton for different reasons never entirely pull off their roles, Peppard seems plucked off the back of an East Texas pickup. And just as Mitchum elevates Hamilton in their scenes together, Peppard really brings out of the best of Hamilton and himself whenever they're together. 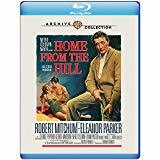 Filmed in Panavision, Home from the Hill looks great on Blu-ray, the image sharp and the color, somewhat overemphatic at times at Minnelli's direction, really standing out and the added clarity allowing viewers to appreciate the performances more. Likewise, the DTS-HD 2.0 stereo surround mix is effectively aggressive, and Bronislau Kaper's excellent score comes off particularly well. English subtitles are offered. The lone extra is a trailer. Not great but far from terrible, with many worthwhile moments, Home from the Hill is Recommended.